→5 Best Backpack Sprayer – Check Here Before Buying! Some backpack sprayers have manual pumps with a lever that will pressurize the tank. Manual pumps are the cheaper choice. You could purchase battery-operated pumps, which means you have no extra work to do yourself. Battery pumps also make your job easier. Each sprayer has a different size tank. Larger tanks are better for those who have more ground to cover. Smaller tanks are best for homeowners without a lot of property or who can’t physically carry larger tanks. ​There are several different nozzle types available on the market. Most people prefer an adjustable nozzle that lets you change the spray pattern and pressure. You also want to make sure you consider the material of the nozzle. Plastic nozzles are cheaper, but they won’t last long when exposed to harsh chemicals. Metal nozzles last longer but cost more. You have to weigh the pros and cons. Depending on your tank size, you might have to carry 10 to 70 pounds around your property. There should be a well-constructed strap that provides comfort. If you find a backpack sprayer with a chest and waist strap, the weight will be evenly distributed across your entire torso. If possible, try on the backpack sprayer before purchasing. You want the shape and position of the handle to be comfortable. Most sprayers come with some extras to make their product stand out. You might like the shut-off switch on the wand. Some wands come with extensions, making jobs easier. Read the descriptions to find out what the company includes. 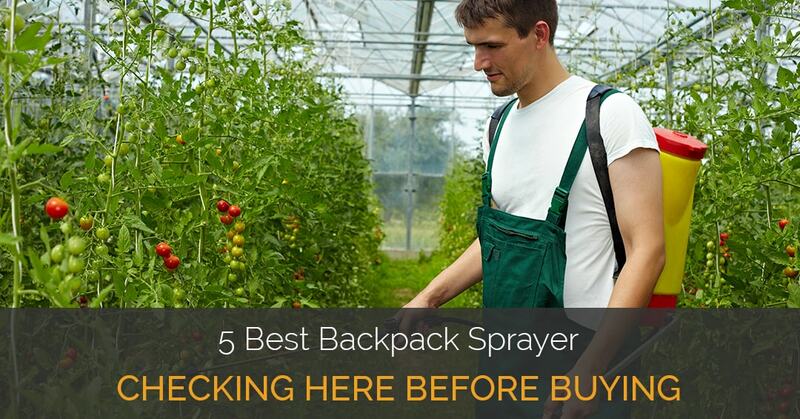 The last consideration is how you plan to use the backpack sprayer. For example, do you plan to use more oil-based products? Do you want to use powder-based products? It is important to know how you plan to use it, guaranteeing it can handle that application. Field King has a highly rated backpack pump that advertises as a no leak pump. When it is on your back, the only dampness you should feel is your sweat. Chemicals won’t leak out of the tank, which could destroy your clothing. Field King is a professional backpack with high-quality materials and features that make your life easier! Something negative to consider is that it is a manual pump. You have to pressurize the sprayer during the entire job manually. The spraying pressure isn’t very consistent as you might expect. When the tank is filled with four gallons of chemicals, the entire sprayer will weigh close to 50 pounds. The Field King No Leak is great for those who don’t have a lot of ground to cover. If you want a sprayer with a lot of comfort features, this sprayer has multiple straps to distribute the weight. It also is great for those who don’t have a lot of money to spend. Adjustable shoulder straps, a padded chest strap, and waist belt. User’s manual isn’t very helpful for questions and how-to use instructions. The Solo 473 is a 3-gallon backpack sprayer that only weighs 10.15 pounds. The filled weight is around 35.65 pounds. It features a rod-actuated piston pump that works for a variety of chemicals. With Viton seals and a durable tank, it is meant to last for years to come. Users get extra features, like four nozzles: adjustable, fan spray, hollow cone, and jet stream. While the 473 is great for many jobs, you cannot use it for powder-based chemicals. Another negative to the 473 is that you do need to pump the handle to create the pressure required. The 473 3-Gallon is smaller and weighs less than other models, perfect for those who have smaller sized jobs to complete. Elderly homeowners prefer the Solo 473 because it is easier to carry with them. Wand is awkward to store. The Chapin 4-Gallon is a top-of-the-line pick for the best backpack sprayer. The most obvious difference is that it runs with a 20V Black and Decker battery. The battery doesn’t increase the empty weight; it is 10.5 pounds empty. It is one of the lightest battery backpack sprayers on the market! With pressurization at 25 to 30 PSI, you can spray chemicals 35 feet with this sprayer. Everything has issues, and this backpack sprayer is no exception. Many users complain about the badly designed lid. You need a good seal, but it is difficult to thread on correctly. The other major complaint is the quality of the straps. They aren’t as well-made as one would hope, especially at this price level. While everyone can love and enjoy the Chapin 4-Gallon Battery Sprayer, it is ideal for those who want to avoid labor-intensive pumping. You can maintain a consistent pressure and output without any extra work. Comes with shoulder, waist and chest straps to distribute weight evenly. The battery must charge for three and a half to four hours before using. The charge only lasts 1.75 hours. My 4 Sons 4-Gallon Battery Powered Sprayer has a high rating from users. It pressurizes from 0 to 60 PSI and features an adjustable output, an adjustable brass nozzle and other wonderful features. When compared to the Chapin battery sprayer, My 4 Sons can last for eight hours on one charge! That is amazing since Chapin only lasts for less than 2 hours. While the M4 has some flaws, customers rave about its usefulness. One thing to consider is that this backpack sprayer weighs 12 pounds dry. Once you add in the 4 gallons of chemicals, you will have 60lbs on your back. It isn’t for someone who has a bad back. The M4 is best for homeowners or those who have to spray a lot of property. The 4-gallon tank and eight-hour battery life allow you to get a lot done without having to stop. Plus, you can use it with most types of chemicals without clogging. Has a locking trigger for continuous spraying. When filled, this tank is heavy. Our last choice for the best backpack sprayer is by FlowZone. It stands out because it offers you the choice to roll the sprayer instead of carrying it. You don’t have to worry about pumping at pressure. The spray reaches an average of 15 feet with a pressure of 45 PSI. Best of all, it sprays much faster because of the strong battery. A major negative to consider is that the battery only lasts 45 minutes. You won’t be able to use it for large projects without having to recharge. Then, you have to wait for two more hours to get a full charge again. The FlowZone is ideal for those with smaller properties. Also, it is better for those who want to have the option not to wear it on their back. If you do want to wear it on your back, FlowZone includes padded carrying straps. You can roll instead of carrying on your back! Comes with an adjustable nozzle. Battery only allows for 45 minutes of continuous spraying with consistent pressure. There are so many great choices for the best backpack sprayer, but one stands out amongst the rest. The Chapin 4-Gallon features an impressive 1.75-hour charge, which is more than enough to tackle most projects. Chapin added protection against rust and corrosion, so it will last for years to come. Durable, 21 inch stainless steel wand with the highest quality Viton seals for chemical resistance. 4 nozzles included: brass adjustable, 2 flat fans, and foaming nozzle. Also accepts TeeJet nozzles. Easily and effectively handles liquid disinfectants, fertilizers, herbicides, pesticides and formulations for tree, shrub and plant protection. High-performance piston pump for increased pressure capabilities of up to 90 psi and commercial shut-off valve with lock-on/lock-off feature to minimize use fatigue. Viton seals in key locations ensure long service and durability. Interchangeable pump handle for left or right-hand operation and 48" nylon-reinforced high-pressure hose for extended reach.